This was one of my favorite dishes during my childhood. My mom never made it but my parents bought this for me during Christmas time. But while browsing through online forums, recently i got a chance to try this dish at my home. To my surprise it turned to my delight and i am happy to present here. do also let me know your views on this. Here is the "Link" where you can find many different cake pops. Do visit this blog and enjoy the tasty and beautiful pops. Notes: One can use any flavor frosting or can use home made one. Sieve all purpose flour, corn flour, baking soda, baking powder and salt into one bowl and keep it aside. Then combine butter, sugar and vanilla essence into another bowl. Whisk till you get smooth and creamy mixture. Whisking can be done with hand blender or normally with ladle. Add sour cream and mix again well. Then mix in flour mixture into wet ingredients and fold it well. Remember not to over mix the flour into wet ingredients for the best result of the cake. Pour the cake mixture into baking cake pan and bake it for 25 to 30 minutes. To check the cake, prick the toothpick at the center of the cake, if the toothpick comes out clean, without batter on it, then the cake is done. Allow the cake to cool down. Once the cakes cools down, divide the cake into small pieces and scrambled it into grainy texture. Into scrambled cake mixture, add vanilla frosting and knead well till you get soft kind of dough. Now scoop out the mixture into your hands and shape into round shape. Place all the round shaped dough into plate which should be lined with parchment paper or wax paper and keep the plate into freezer for 15 minutes. Meanwhile melt the candy chocolate into microwave for 30 to 40 seconds. Stir well till you get smooth candy mixture. Avoid any lumps by stirring it continuously. When the shaped dough are set into freezer for 15 minutes. Take it out . Dip lollipop stick into melted chocolate and push the stick through the cold cake pops. First push the stick into bigger size balls and then into smaller ball. Dip the cake pop into meted chocolate and allow any excess chocolate to drip off before you invert the pops in the foam. Leave the cake pops in the foam until the chocolate sets. When chocolate hardens, decorate the snowman. 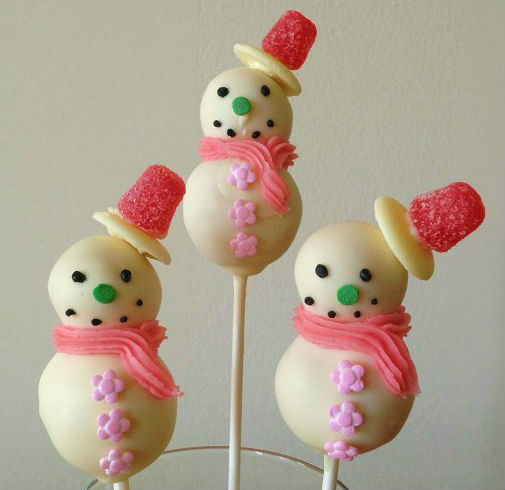 Stick his hat by using melting candy, make its eyes, stick its nose and buttons. 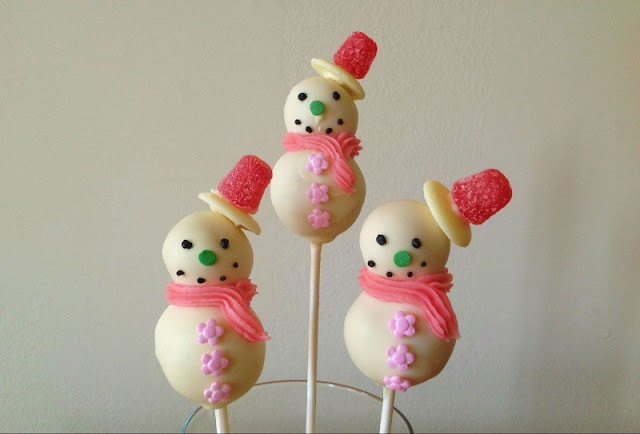 Lovely snowmen cake pops are ready. Damn cute and elegant pops, who can resist to it. Cake pops look so beautiful and perfect for the season.